What you can do with a ribbon spool….. I have to start off this post with a family update! If that isn’t your thing, then feel free to scroll down 😀 Past the RED Dotted line! I am happy to report that my grandpa made it out of surgery, and is doing well! The first 48 hours are critical, but so far so good! They took him off life support yesterday, and pulled out the breathing tube. No sooner was that out he was asking for coffee!! (See the coffee love runs deep through the family tree :D) So they entertained the idea, and after a few sips he couldn’t really tolerate much more. I’m sure his throat is SO SORE after having that tube in. I know I only had a breathing tube in for like 40 minutes for my surgery and I could barely talk for 3 days. For ME that is an ETERNITY!!! He was sitting up in bed, and joking with all the nurses (sounds familiar doesn’t it! LOL!!). He is such a sweet man I’m sure he is one of the best patients. They are very impressed with his progress. I am so thankful that he is doing so well. I am also thankful that we live close enough to one of the best hospitals in the world! I really want to thank you all for the thoughts and prayers 😀 My family appreciates that very much. Now I am TRYING to convince him that once he is fully recovered he should take some of his savings and take that life long dream trip to Las Vegas! WHY save it for his family or anyone else to use after he is gone?! He worked hard his entire life! He should live it to the fullest!! He would have so much fun. He deserves to reap what he has sewn. I really hope he seriously considers it. There has been so much going on here, I can never claim to lead a boring life! I have been busy (as you all know for VERY good reasons :D) and sadly my actual stamping time (and projects I can share) has been limited, leading to my lack of posting. Trust me though, after the holidays I will be sharing so many great projects! To hold you over for another day or two, I did get to go GREEN!! Now what do you think this hanging wreath ornament was designed from? I love recycling items! As papercrafters we get some really cool, USEFUL stuff with the items we spend our money on. Sometimes it is just a matter of seeing the POSSIBILITIES of saving something for another use….even if it is for “someday”. You will soon realize that hoarding those items that you KNOW someday MAY be of use isn’t really all that bad! Well, not bad for the project, maybe bad for SPACE issues! LOL! Well as you can see this is the PERFECT project for just that! I made this wreath just in time for the holidays! You could take various scrap ribbons and make a really fun shabby chic kind of decoration for ALL year through too. All you need is a empty ribbon spool. My sizes may vary depending on YOUR spool size, but this is a standard size spool. A stamp set for the center of your wreath. I chose to use Merry Little Christmas Borders & Centers Round 1-5/8” . I thought it was perfect for my wreath center. Plus JustRite Stampers is having a 20% OFF Sale —–>HERE! A large scallop circle. 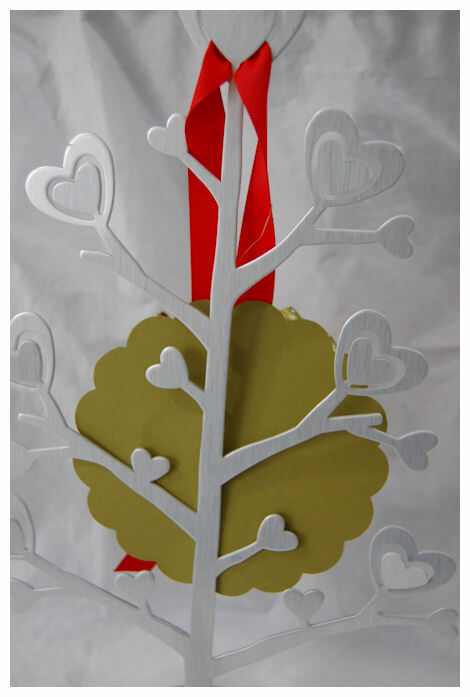 This project used my Cricut Expression Home Decor Cartridge-5 inch scallop. Then, your hanging ribbon color of choice. First thing you need to do is wrap some of your ribbon around the empty spool (where your ribbon would have been wrapped around). This will hide the plain, empty cardboard roll. Make your hanging loop, and glue it to the BACK of the ribbon spool. Glue the large 5 inch scallop circle to the back of the ribbon spool. This makes the back side finished, and hides the ribbon hanger! You can also add a family photo, or a message to the back! Now you are ready to build your wreath! Starting at the TOP you will work from the outside-in. By having your back piece on you will have a guide as to how far in to place your ribbon pieces. Your ribbons will get folded in half, so this will help you judged placement! 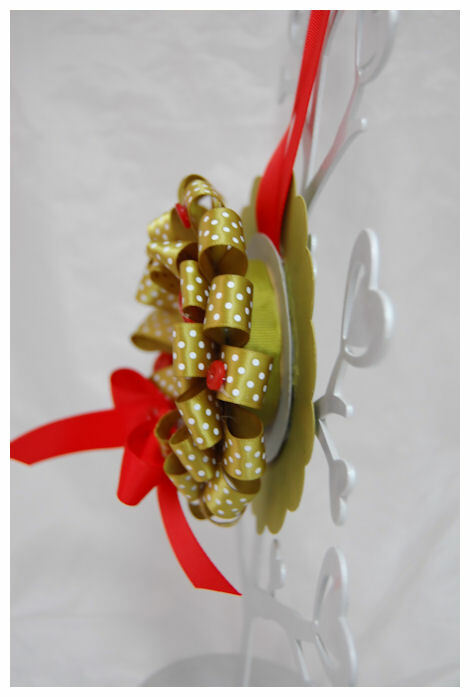 You can even take a pencil and draw a quick guide onto your ribbon spool for a PERFECT wreath. Now, take your 3 inch ribbon scrap, and put a dab of hot glue on the ribbon spool, and attach ribbon end. Fold in half, then glue that end to spool as well. Work around the spool until the outer row is complete. About 16 ribbons will fit around the outside edge. Now begin your second row. You will want to make sure this layer of ribbons is in between each of the ribbons around the outer edge. Now to HIDE the ribbon ends, and the OPEN hole in the ribbon spool center you will want to add a nice sentiment! How sweet will this look on a tree or on a door?! Love it. As I said above I chose to use Merry Little Christmas Borders & Centers Round 1-5/8”. The bells have a Sakura glitter pen on them, and I used a white singlo gel pen to create dots on my olive ribbon on my image, just like the ribbon on my wreath. The bell image is popped out of the center sentiment using dimensionals. I wanted some extra pop. I then hot glued my buttons on as well! Trust me this thing is stuck together for LIFE! LOL! I sang “Have yourself a Merry Little Christmas” the entire time I made this! I love that song 😀 I love ALL the Christmas songs that come on the radio this time of year, along with the specials on TV. I usually have so many great memories associated with each one. I really enjoy this season. The world seems so much more full of kindness, love and good will. Despite the economy people are always more compelled to help others, reach out, be kinder, and seem to be more cheery! Well, unless you go shopping on Black Friday! OH BOY! People can be NASTY that day. Which I personally don’t get. I always go shopping on black Friday, and my opinion is IF you are going you NEED to be in a good mood, and KNOW you ARE going to stand in line for a very LONG time, and you are not likely to get EVERYTHING on your MUST HAVE gift list! If you can’t be patient or aren’t prepared for that, then please don’t show up! LOL! OH! and you can’t complain about the lines either. Its part of the day. Grab a coffee and just stand in line with a smile. Also the more cheery you are to the poor retail people working, the more apt you are to get their help! Sorry! Not sure WHY I went there! LOL! Anyway, I am not sure if I will check in tomorrow or not, as I am cooking cookies and stuff with the kids, but if I don’t please have yourself a WONDERFUL and SAFE Thanksgiving. I hope you are able to really take a moment of pause to reflect on all you have in your life to be thankful for. Remember that even during tough times there is usually something to be thankful for. The hard times won’t last forever. I always look back on the past year, and at my family and friends. I truly feel like I’m one of the most blessed people in the world 😀 I am ever grateful for each and every second I have with my family. I have been so blessed by so many, including all of you! I get so much joy from sharing with you all and the interaction I have from each of you as well. I have gained many amazing friends from my love of sharing this craft with the world. So thank you for giving me another thing to be grateful for! I’d love to end this post by YOU sharing something you are thankful for with all of us here. It will feel so good to reflect on that.